Mad Cartographies: Wilderness of the Soul will highlight selected works from The Icarus Project’s 10 year anniversary collection, as well as featured work by Jacks McNamara, Faith Rhyne, and Cherise Clarke. The Icarus Project is an international radical mental health support network, alternative media project, and online community by and for people struggling with the experiences commonly labeled as “mental illness.” By these individuals joining together as a community, the intertwined threads of madness, creativity, and collaboration can inspire hope and transformation in an oppressive and damaged world. This show boldly navigates the space between brilliance and madness, offering glimpses of rarely charted inner territories and re-imagined worlds. 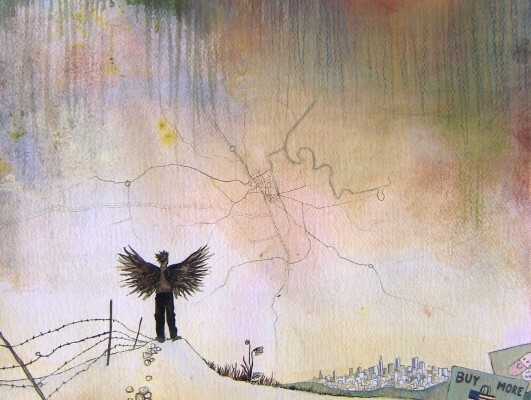 Featuring original paintings and reproductions of art from the first 10 years of The Icarus Project, this show was originally mounted in San Francisco, CA in 2012. The collection includes work by Eric Drooker, Fly, Sarah Quinter, Becky Cloonan, Sophie Crumb, Bec Young, Jacks McNamara, and more. Much of the work is rooted in a DIY, punk rock aesthetic, and includes archival posters, graphics, logos, fliers, book covers, stickers, stencils, and other work from The Icarus Project’s many publications and events over the years. Mad Pride is an international movement created by psychiatric survivors, consumers, folks labeled “mentally ill” — all of us that proudly reclaim the words mad & crazy, and those in solidarity with us. We are mad. We are crazy. And we are damn proud to be. We believe madness is a completely sane and well-adjusted response to living in such a mad world. In Sept 2013, Vancouver Mayor Gregor Robertson declared a Mental Health Crisis. We know what this means: using the language of “care” and “support”, civic government will co-ordinate the total control of the lives of the most marginalized people in society – those of us called mad. Talk back, fight back, make art. In Gachet’s basis of unity, “We work for the elimination of discrimination against people marginalized by their mental health, trauma and/or abuse experience.” And we use art to do just that. All of this madness will culminate in a Mad Pride Cabaret of festivities taking place on Saturday, July 12th 2014, 7 – 10.30pm as part of International Mad Pride.